Continue to follow A52. Continue straight onto Sturt Highway. Stay on Sturt Highway, Turn Right onto Gomersal Road. Follow Gomersal Road all the way to the end. At the end of Gomersal Road turn right onto Barossa Valley Way. Turn left after about 110m into our enterance. You will see our sign at the end of Gomersal road pointing to our entrance. There are very few wine lovers who have not sampled a drop from the Barossa Valley. Australia's best-known wine region and South Australia's most visited tourist destination is also the home of Discovery Parks - Barossa Valley. 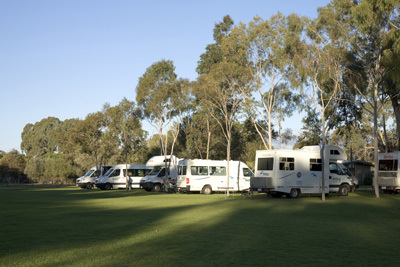 Our caravan park is just a few minutes from the centre of Tanunda, a great place to begin your tour. Explore the vine-covered plains and hills that surround charming townships and Lutheran churches, with their distinctive square spires dotting the rural landscape. With so many wineries, historic buildings, museums, scenic tours, bush walks, art galleries and amazing dining experiences, you won’t want to waste a moment. 2 queen size beds and 2 single beds. This ultra modern 3 bedroom villa has all the comfort of home plus more. Including open plan living, fully self contained with laundry and kitchen including a dishwaher. Flat screen TVs, DVD players, CD players, iPod docks and all linen supplied. A private courtyard containing your own full size BBQ and outdoor setting. Ideal for couples or families. You still have use of all park facilities as well. 1 queen, 2 singles. This ultra modern 2 bedroom villa has all the comfort of home plus more. 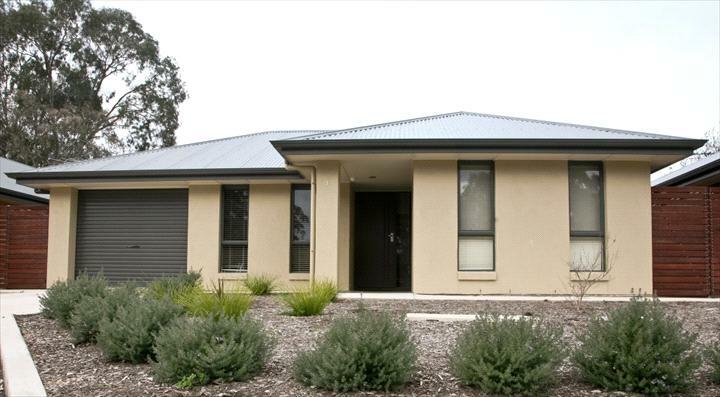 Including open plan living, fully self contained laundry and kitchen including a dishwasher. Flat screen TVs, DVD players, CD players, iPod docks and all linen supplied. A private courtyard containing your own full sized BBQ and outdoor setting. Ideal for couples or families. You also have full use of all park facilities. Two bedroom cabin with a queen bed and all bedding supplied. This cabin also has 2 sets of single bunk beds. 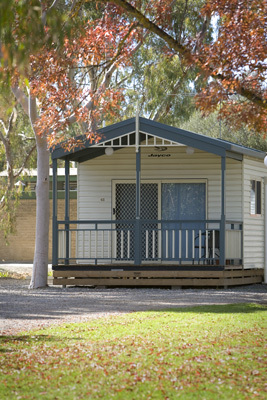 It is a fully self contained cabin with an ensuite and cooking facilities. This is a one bedroom cottage. It has a queen size bed with all bedding supplied. 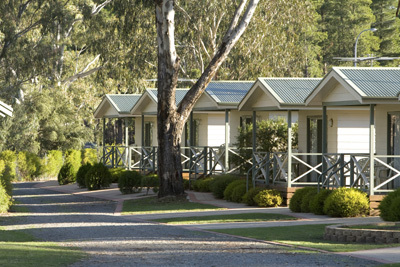 It is a fully self contained cabin with its own ensuite and kitchenette. It also has a DVD player and Austar. 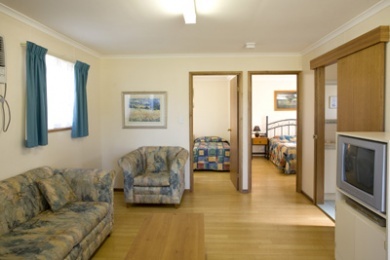 This is a two bedroom cabin The main bedroom has a queen size bed with all the bedding supplied. This is a fully self contained cabin with its own bathroom and kitchen. It also has a TV, DVD Player and Austar. This is a ensuite cabin. It has basic cooking facilities. 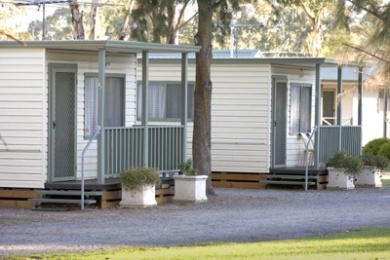 Its bedding is a double bed in the living area and a set of bunks and a single bed in another area. Bedding and linen is supplied. All our powered sites include power, water and sullage on site. We have both grass & gravel sites. CANCELLATION POLICY: A $20 cancellation fee applies for all cancellations notified more 30 days prior to check in. All other monies paid will be refunded. Cancellations between 14-30 days prior to check in date will forfeit 50% of all monies paid. Cancellation of less than 14 days will forfeit all monies paid. Refunds for late cancellations will only be given at the Managers Discretion.